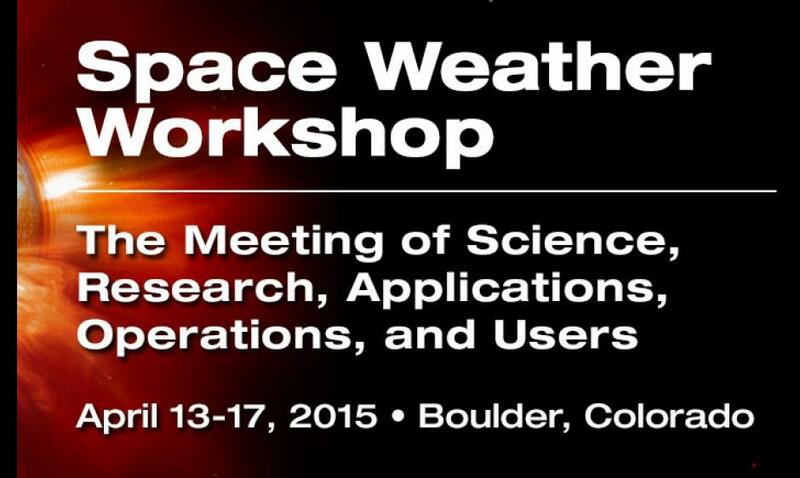 March 13, 2015 – The 2015 Space Weather Workshop will be held April 14-17, in Boulder, Colorado. This meeting will bring together customers, forecasters, commercial service providers, international, and research communities to focus on the impacts of space weather, on forecasting techniques, and on recent scientific advances in predicting conditions in the space environment. The program will highlight space weather impacts in several areas, including aviation, power grids, ionospheric disturbances, and geomagnetic storms and their solar drivers. The conference will also include an update on the national Space Weather Operations Research and Mitigation (SWORM) task force effort underway at the White House. Participants will include representatives from research and development, operational organizations, and industries impacted by space weather, including those from commercial airline, electric power, satellite operations, and navigation/communication industries. Space Weather Workshop 2015 is co-sponsored by the NOAA Space Weather Prediction Center, the NSF Division of Atmospheric and Geospace Sciences, and the NASA Heliophysics Division. Further details regarding the meeting agenda, travel, registration and poster submission are available at: http://www.swpc.noaa.gov/content/annual-meeting.